More power and less weight is always the best combination when a new model debuts, am I right? 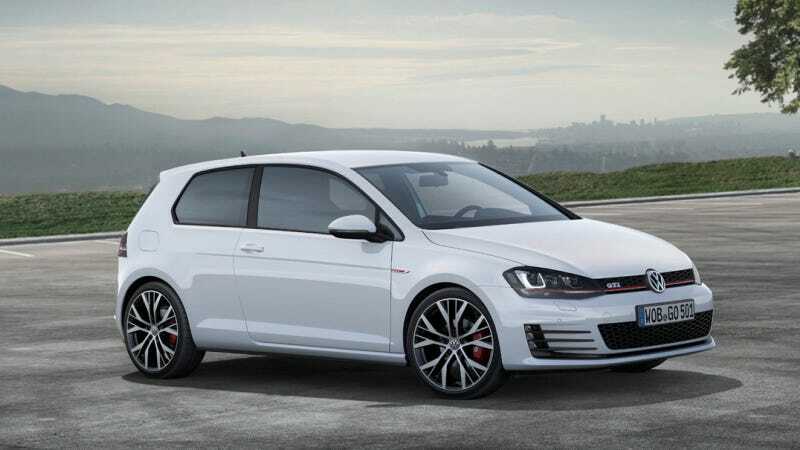 Volkswagen today dropped some new details on the 2014 Volkswagen GTI that will bow at the Geneva Motor Show. The latest version of the hopped-up Golf, which rides on an all-new platform, weighs in at 2,978 pounds — a nice little drop from the old Mk6 car. Even better, it has more power and quite a bit more torque. Again featuring a 2.0-liter turbo four, the new GTI will have 220 horsepower and 258 lb-ft of torque. Horsepower jumps up to 230 if you opt for the new GTI Performance model. That's a nice little increase from the old GTI, which had 200 horsepower and 208 lb-ft of torque. Volkswagen claims the new GTI will do the zero to 60 mph dash in roughly 6.4 seconds. These are all the specs from the European model, which goes on sale in May. We'll have to see if the U.S. version will be different at all. The outgoing GTI was always a compelling car to drive, even if it was down on power compared to some of its hot hatch competitors. This boost could put the car on more equal footing with the Ford Focus STs and Mazdaspeed3s of the world. What do you guys think?